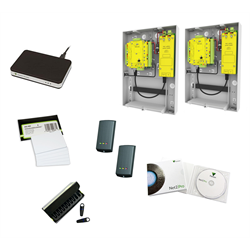 The Paxton Net2Plus is an advanced access control solution. A Net2 installation can control a single door, or expanded to control hundreds of doors and can support up to 10,000 users. Multiple Net2Plus controllers can be connected to each other by way of TCPIP or RS485. This greatly increases the number of installation options available. One Net2 plus can also be used as the TCP/IP interface for an RS485 daisy chain of Net2 plus and Net2 classic units. Net2 systems may be used with a choice of proximity readers, hands-free devices, cardlock (magstripe) readers and TouchLock keypads. Net2 is also compatible with a range of 3 third-party readers, including biometric readers. Hands-free access control enables any Net2 door equipped with P series PROXIMITY readers to achieve hands-free ranges of up to 2.5m. Doors are converted to hands-free simply by wiring a hands-free interface between the reader and control unit. Hands-free tokens are then supplied to users who require hands-free access. Both standard Net2 and hands-free tokens will work on a Net2-equipped door.